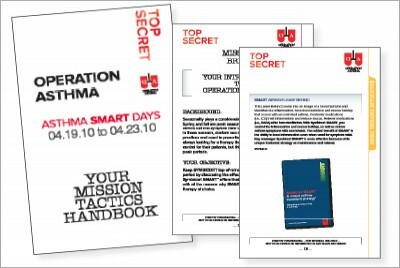 Pharmaceuticals Handbook :: INHOUSE Productions Ltd.
Operation Asthma – Mission Tactics Handbook for physicians – a guide to using Astra-Zeneca’s inhaler product in a ‘TOP SECRET’ codebook style format. Pages designed with coloured ‘tab’ graphics to indicate the sections while remaining within the trimmed page size. Final product is spiral bound with hard cover and CD insert. Designed by INHOUSE in February 2010.